Australia's four year plan is trialling peer-to-peer filtering under the head of Senator Stephen Conroy. The plan was originally thought to only contain the "world wide web," through which people read normal news sites, but Digital Economy Future Directions blog reports that Conroy is going after file-sharing applications such as BitTorrent, too. "Technology that filters peer-to-peer and BitTorrent traffic does exist and it is anticipated that the effectiveness of this will be tested in the live pilot trial," said Conroy. Senator Conroy was quick to deny implications of internet censorship, however. 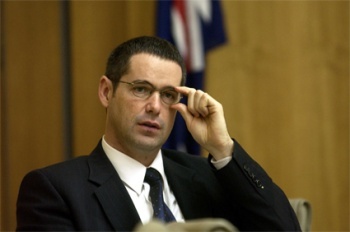 "Freedom of speech is fundamentally important in a democratic society and there was never any suggestion that the Australian Government would seek to block political content," Senator Conroy said, "In this context, claims that the Government's policy is analogous to the approach taken by countries such as Iran, China and Saudi Arabia are not justified." I'll leave you with a comment from "Nicko" from the blog: "Minister, you are to Broadband and the Digital Economy what King Herod was to the Bethlehem Playgroup Association."